Media is extremely important in spreading all sorts of news to a broad, and often unknowing public. Recently, an investigative essay by Michael Moss in The New York Times told the story of the ways in which nonhuman animals (animals) called "food animals" are brutalized at a Nebraska research facility, all in the name of profit (please see "'Food Animals'" Brutalized at Federally Funded "'Meat Lab'" for details). What I found interesting about Mr. Moss's essay is that it generated bipartisan support in the US Congress to stop the torture of these "research animals." As a researcher I was astounded that it took an essay in The New York Times, not scientific essays about animal sentience nor popular reports about these essays, to motivate politicians to get involved in protecting these animals. We don't need more science, we need more action that can easily and solidly be based on what we already know about how these animals deeply suffer. Another essay in The New York Times by Nicholas Kristof called "To Kill a Chicken" also caught my eye. It begins: "If you torture a single chicken and are caught, you're likely to be arrested. If you scald thousands of chickens alive, you're an industrialist who will be lauded for your acumen. That's my conclusion after reviewing video footage taken by an undercover investigator for Mercy for Animals, an animal rights group. The investigator said he worked for two months in a North Carolina poultry slaughterhouse and routinely saw chickens have their legs or wings broken, sometimes repeatedly - or, worse, be scalded to death." What's striking about the undercover video, which Mercy for Animals plans to release on its website this weekend, is the speed of the assembly line, leading workers to fall behind in ways that inflict agony on the chickens. It's a process that maximizes productivity and profits, and also pain. Workers grab the birds and shove their legs upside down into metal shackles on a conveyor belt. The chickens are then carried upside down to an electrified bath that is meant to knock them unconscious. 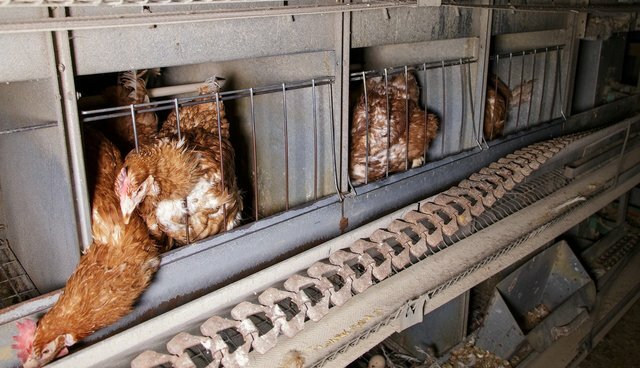 The conveyor belt then carries them - at a pace of more than two chickens per second - to a circular saw that cuts open their necks so that they bleed to death before they are scalded in hot water and their feathers plucked. The Agriculture Department calculates that about 700,000 chickens a year in the United States are "not slaughtered correctly" - often a euphemism for being scalded to death. The company that operates the slaughterhouse, Wayne Farms, said it had reviewed the video and found no evidence of abuse. A spokesman, Frank Singleton, said that the company uses "industry-standard methods of humane slaughter." Think about that. If a naughty boy pulls feathers out of a single chicken, he's punished. But scald hundreds of thousands of chickens alive each year? That's a business model. Mr. Kristof also writes, "I raised chickens as a farmboy. They're not as smart as pigs or as loyal as dogs, but they make great moms, can count and have distinct personalities. They are not widgets." I just want to point out, as have many others, that there is no relationship between intelligence and loyalty and suffering. Supposedly "dumber" animals do not suffer less than "smarter" animals (please see "Do 'Smarter' Dogs Really Suffer More than 'Dumber' Mice?" and "Are Pigs as Smart as Dogs and Does It Really Matter?"). Cross-species comparisons are fraught with error and each individual's pain is her or his own pain. I also like to ask the generic questions, "Would you do it to your dog?" or "Would you allow a dog to be treated like other mammals or food animals who are brutally tortured on the way to our mouth?" When I ask these questions some people are incredulous and ask me why I do so. For one, they point out the inconsistency with which we treat other animals and these questions have always yielded very valuable discussions about the emotional lives of the sentient beings with whom we interact and use and abuse in a wide variety of venues. Who (not what) we eat is on the minds of many people and the conclusion of a another essay in The New York Times by Nicholas Kristof called "Can We See Our Hypocrisy to Animals?" is a good way to end this essay. Mr. Kristof writes, "May our descendants, when, in the future, they reflect uncomprehendingly on our abuse of hens and orcas, appreciate that we are good and decent people moving in the right direction, and show some compassion for our obliviousness." Scalding chickens is "business as usual"
I'm thrilled to see these essays appearing in The New York Times and hope they really serve to make a change in how food animals are treated. I leave it to you to decide whether to read them, but be assured that when you eat chicken and other "food animals" you're eating pain. Scalding chickens and brutalizing billions of sentient beings is "business as usual" - perfectly okay and encouraged for profit and productivity - at so-called factory farms. Of course, the bottom line is that billions of food animals suffer the most enduring and deep pain as they're brutalized to become meals, and we must stop this heinous treatment right now. We don't need to wait for "the science" nor for politicians to get involved. Everyone can do this right now - today - simply by choosing other meal plans.